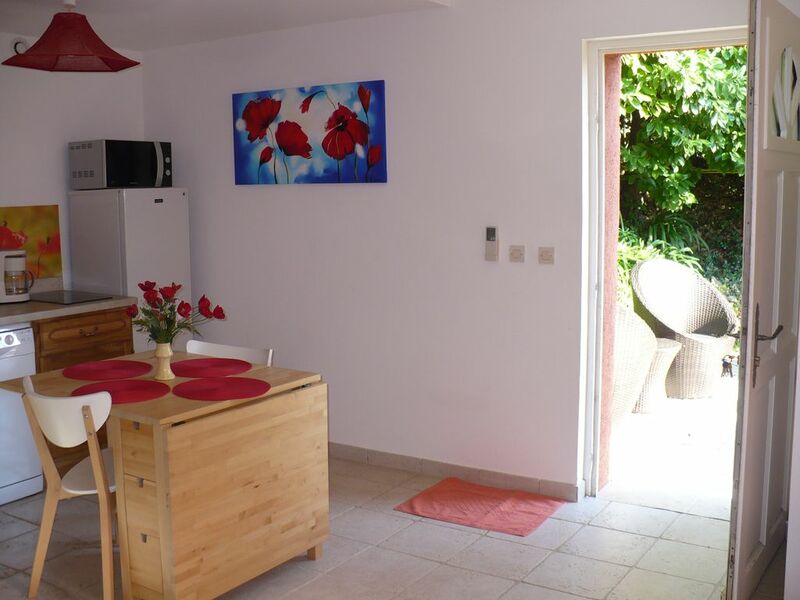 The Soleil Rouge house rental classified 3 * in 2016, offers for rent by the week, weekend or night of cottages for 2 to 6 people comfortably equipped in the heart of the Esterel Mountains. Enjoy a stay in the countryside while being close to the hustle and multiple recreation of the French Riviera. Located 18km from Cannes and Fréjus, 30 Mn from Nice Airport and 5 mn of the motorway A8. This location has all the equipment needed to remove enjoyable stay. Our pets are allowed but must be educated, clean and leashed in the property. For the comfort of all our accommodations are non-smoking. The offer consists of a studio for 2 persons (28 m2). The cottage has a kitchenette equipped a ceramic hob, microwave grill oven, Refrigerator, Freezer, Dishwasher. A living room with a spacious and comfortable bed, table, chairs, wardrobe, flat screen tv. A shower room with souflant dry towel. A private terrace with garden furniture is at your exclusive use and a solarium with a special exhibition at the pool reserved for rentals. The closed parking is free as well as Wifi Internet Access. A Washer of 9 Kg in the common laundry room is available on request. Can supply sheets and towels as well as toiletries and cleaning kit. The Esterel Massif is a special place on the Riviera for several reasons. This is practically the only backed coast between Menton and Toulon or nature has kept all these rights. Since the beautiful coves of the gold cornice or the blue of the sea and the red rock mix up Mt. Vinegar peaking at 600 meters altitude and bathed by 300 days of sunshine a year you will find the same scent in Corsica whose common rocks and drift back to the Cenozoic. Situated on the southern flanks, the Provencal village of Adrets de l'Esterel is the heart of this massive majestic. Top residential, it is acclaimed for its quality of life while being very close to the urbanization of the French Riviera. A 3 km from the junction of Highway A8, the Adrets of Esterel, are only 15 minutes from Cannes or Frejus, 30 minutes from Grasse, the world perfume capital, 5 minutes from Lake Saint Cassian and villages of Montauroux and Fayence. Sights such as St. Tropez and the Gorges du Verdon are an hour away. Bathroom with shower, toilet, sink, vanity unit, souflant dry towel. Closed parking available with a trailer or bike. Occupation d'un studio du 10 au 17 avril 2016: séjour inoubliable ! Accueil chaleureux et attentif des propriétaires. Studio "coquelicot" très confortable, décoration de bon goût, équipement complet, bien conçu et propreté exemplaire. Terrasse privative ombragée et à l'abri des regards. Domaine soigné et fleuri situé au coeur du massif de l'Estérel dans un cadre de verdure remarquable. Ravie que la propriété ait été pour vous un séjour inoubliable. Le vrai calme à 15 minutes des animations balnéaires!! super séjour dans un gite très propre, très fonctionnel, et qui gagne à être connu!! un grand merci aux propriétaires pour leurs précieux conseils qui nous ont permis de passer des moments magiques dans des coins méconnus...et magnifiques !! Je le conseil pour tout types de vacanciers véhiculés..
Cela a été un plaisir de vous recevoir. A trés bientot dans l'Estérel pour découvrir encore plus notre belle région. Nous avons loué le studio coquelicot : location toute neuve ,propre et bien équipée , décoration très soignée ... L'accueil fut sympathique. Un grand merci à nos hôtes : grâce à leurs conseils sur la région ,nous avons passé de très belles vacances . C'est avec plaisir que nous vous avons accueilli chez nous, pour vous faire profiter de notre belle région française. Des vacances heureuses voila ce que nous souhaitons pour tous nos locataires. My boyfriend and I were looking for a low-cost but still nice place to stay during our trip to the south of France: Soleil Rouge was exactly what we wanted! First of all, the region is BEAUTIFUL, as is the drive to the house. Soleil Rouge is nestled in a rich green hilly region, 20 minutes away from Cannes by car. The house is beautiful and newly renovated (the landscaping was still underway). The owners of the house are very nice people who made us feel just at home. The house is divided into four sections, three of which are for guests. We stayed in the Lavender room that was very well equipped with everything we needed (except toilet paper and dish soap, although I think we might have left some there for the next guests...). It's the perfect size for two people with a really comfortable bed and a nice bathtub (although in the hotter summer months I would say not to run a bath too often since the region is prone to droughts). We had a beautiful view of the hills both in the mornings and in the evenings. There was swimming pool and a tanning deck. Everything was so perfect and we look forward to going again! The one teeny tiny concern I had, which is negligible actually, was that there was no floor mat in the bathroom. Otherwise, like I already mentioned, wonderful place, great location, and awesome for our wallets! Seeyou soon in Esterel and caresses Theo.